I made this for a friend of mine when he came to our house for a weeknight dinner. He's the kind of guy who will eat hot wings seven days a week if given the opportunity so I knew I had to make some hearty boy food. I also wanted something healthy as I'd promised to make margaronas (a margarita with an upside down Corona stuck in it...) which are decidedly unhealthy. This dish seemed like a good balance. In the end, I failed to deliver on the margaronas (really...a Corona stuck in it) but as my friend reached for a third helping, it didn't seem to matter. The recipe calls for canned chipotle peppers in adobo sauce. I only use one chipotle pepper and bit of sauce, though they usually come in a can with several. You can add more peppers if you like but be warned, these are spicy little guys. Save the rest of the peppers and sauce in a container in the fridge and add them to chili, soups, or salsa. You can use leftover avocado cream as a dip for fresh veggies, serve it on a sandwich instead of mayo, or use it as a garnish for eggs. This dish is also great if you omit the tortilla and serve it over rice, sort of like a burrito bowl. I also occasionally add a fried or poached egg on top for a high protein/breakfast version. To make the avocado cream, scoop out the avocado into a bowl and add the yogurt, salt, and lime juice. Mash with a fork until roughly combined then puree with a hand mixer. If you don't have a hand mixer you could also make this in a blender or food processor. In a large pot, heat a drizzle of olive oil over medium-high heat. Add the onion and cook until translucent and soft, about 5 minutes. Reduce the heat to medium. Roughly chop one chipotle pepper and add it to the pot, along with about a tablespoon of the adobo sauce. Add the chopped tomato and stir to combine. If it's winter and your tomatoes aren't very juicy, I recommend adding a tablespoon of water as well. Season with a pinch of salt and freshly grated black pepper. Cover with a lid and cook for 2-3 minutes. In the meantime, strain the beans and rinse under cold water until the water runs clear. Add the peppers, beans, and corn to the pot and stir. Reduce the heat to low, cover with a lid, and cook for another 2-3 minutes just to heat through. Remove from the heat and stir in the chopped cilantro. Warm the tortillas in the microwave for a few seconds so they are easier to fold. 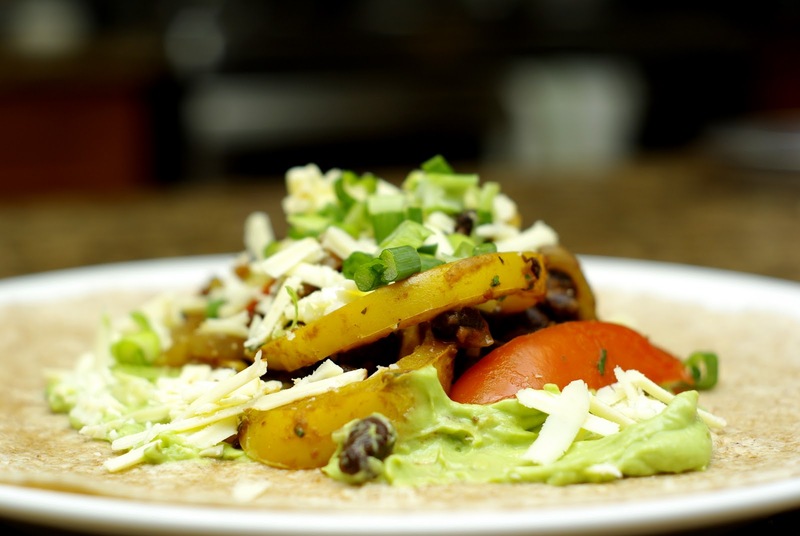 Spread a dollop of the avocado cream in the centre of the tortilla. Top with a generous spoonful of the black bean mixture, some grated cheddar cheese, and a few chopped green onions. Roll up the tortilla, tucking the ends in, and serve. Yummm.....this looks delicious! I will have to give it a try! Thanks for your comment! I hope you enjoy it! The burritos look delicious and loved the avocado cream!